Our vicar, Rev. Carol Carlson was born and raised in the Diocese of Northwestern Pennsylvania. Carol (as she is called by everyone at Holy Cross) graduated from Harvard University with a concentration in English Literature and pursued that interest in graduate study at Oxford University in the UK. Her seminary training was at the Episcopal Divinity School in Cambridge, MA. 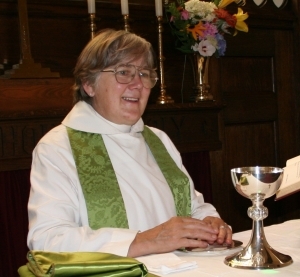 Prior to being ordained in the Episcopal Church she worked for 7 years as a course assistant at Harvard Business School and for 20 years on Sundays as a traveling preacher for the Presbytery of Kiskiminetas in central PA.
On the other days of the week she was a Suzuki piano teacher, church organist and baker of Swedish rye bread for local clients. She served Episcopal parishes in Coudersport, Brookland and Smethport, PA before and during her tenure at Holy Cross. Her interests beyond the church include music, gardening, travel, carpentry and the care and feeding of her three dogs. Having built and rebuilt several houses, Carol has had no trouble presiding over the extensive renovations HC has undertaken to its buildings during the past five years. No stranger to hammers and pipe wrenches, scaffolds and paint-rollers, her ministry among us has been ‘hands-on’ in every project. Just as strong is her passion for teaching, and that too, has been playing its part in the ‘rebuilding’ of the Episcopal Church of the Holy Cross.